With slot-machines heading for Anne Arundel County, and the poker tables live in Charles Town, WV, the District may considering joining the surrounding jurisdiction’s more lax approach to gambling. According to Freeman Klopott of the Examiner, Councilmember Michael A. Brown has a bill ready to allow the DC Lottery to manage an online poker system, as well as permit sports betting in DC. 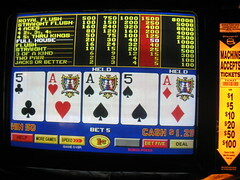 The UIGEA or Unlawful Internet Gambling Enforcement Act, passed by Congress in 2006, which prohibits the transfer of money to organizations for the purpose of gambling online would likely be at play here, even though the organization managing the particulars here is the DC Government and not a Casino and associated bank. The same people that passed UIGEA are the same people that would have to approve this bill with passage in Congress. Though we’ll have had a change in the guard since the 2006 Congress, we’re still facing getting this through a Republican Majority, and a Republican Majority that does not particularly care for gambling. It could be a good share of money, though, as Brown claims it could be worth $13M over three years. Every dollar counts.